In food processor or blender, place beans, reserved bean liquid, tahini, 1/4 cup oil, the lemon juice, garlic, table salt and pepper. Cover; blend on high speed, stopping blender occasionally to scrape down sides, until smooth. Spoon dip into serving dish. Sprinkle with parsley. Heat oven to 375°F. Brush both sides of each pita bread with 1 tablespoon oil. Cut each pita bread into 8 wedges; separate wedges to make 16 wedges for each pita bread. Places wedges, oil sides up, on ungreased cookie sheets. Sprinkle with kosher salt. Bake 10 to 12 minutes or until pita chips are crisp and lightly browned. Serve with hummus. Tahini is a paste made from ground sesame seed. One-half cup of sesame seed can be subbed for the tahini. 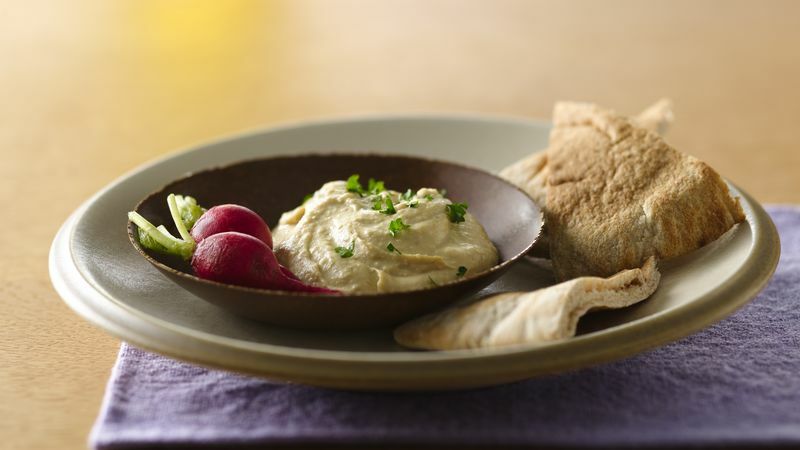 The dip just won't be as smooth as if you'd used tahini. Swirl the surface of the dip with the back of a spoon, drizzle with olive oil and sprinkle with cayenne for an inviting appetizer. Add a signature touch—stir in 1/4 cup finely chopped sun-dried tomatoes for a punch of flavor and color.